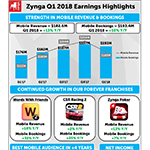 SAN FRANCISCO--(BUSINESS WIRE)--Zynga Inc. (Nasdaq: ZNGA) today released its financial results for the first quarter ended March 31, 2018 by posting management’s Q1 2018 Quarterly Earnings Letter on its investor relations website. Please see the attached Quarterly Earnings Letter or visit http://investor.zynga.com/financial-information/quarterly-results to access the letter. Zynga management will also host a Q&A session at 2:30 p.m. Pacific Time (5:30 p.m. Eastern Time) today to discuss Zynga’s first quarter performance. Questions may be asked on the call, and Zynga will respond to as many questions as possible. Since its founding in 2007, Zynga’s mission has been to connect the world through games. To date, more than 1 billion people have played Zynga’s games across web and mobile, including FarmVille, Zynga Poker, Words With Friends, Hit it Rich! Slots and CSR Racing. Zynga’s games are available on a number of global platforms including Apple iOS, Google Android, Facebook and Zynga.com. The company is headquartered in San Francisco, Calif., and has additional offices in the U.S., Canada, U.K., Ireland, India, Turkey and Finland. Learn more about Zynga at https://www.zynga.com/blog or follow us on Twitter and Facebook.